(10 September 2017) After the club meeting at 10:00 AM was over members headed both west and east of Fernald Station for some trail work. Ken and Cliff moved signs and cut down low hangars while Sean pulled the deck mower and Bruce ran the sickle bar machine to the first causeway. Ron and gang headed east and placed a temporary guard rail at Cotton Valley. They also dropped off gauge rods at Clark Road for the final bridge work over the stream. (26 August 2017) Our track crew was blessed by good weather, as we patrolled north from Canterbury to Lochmere. We cut back sight lines, and cleaned out the flangways at several crossings. Our lunch stop was the Dippsy Doodle, and we're happy to announce that the quality of the food and service has improved back to how it was several years ago. Thanks to the seven members and guests that made it out today! (July 30, 2017) We finished off the second weekend in great style. We had good weather all three days, and kept fairly busy, packing our cars full of excited kids. There was some thought that we might have been creating confusion and delay, and Sir Topham Hatt came over to inspect our operations. He found that we were very useful, and operating to the highest standards. Later Hank invited the band over, and they put on a moving concert! (July 16, 2017) The Club lost lost time member Len Abrahamson. Lenny, as most knew him, was active not only in the CVRTC, but an Industrial Arts teacher, active with drag racing and past president of the local snowmobile club. Sean recalls mentoring him on his first NARCOA excursion. Lenny had already operated his M9 plenty on the Wolfeboro, and "you knew in the first 100 yards that he was more than capable of operating a motorcar"
Lenny enjoyed modeling the Boston & Maine railroad, and would show up at Dave's house during the Tour de Chooch, always bringing some new locomotives to run. He was a real likable guy, and we'll miss his easy smile and contributions to the Club. Rest in Peace! (July 8, 2017) CVRTC members that volunteered during last year's Day out with Thomas™ events had another great day patrolling through Crawford Notch. We had a safe, accident-free trip with twelve cars and 25 riders. The day started off with a safety talk at eight. After our arrival at the North Conway depot, Paul Hallett thanked us for the help the CVRTC does during the Thomas weekends, finishing up with a short safety talk. Off to Fabyan with stops in Bartlett and Crawfords. On our return trip, we met the North Train at Crawfords, where we waited for it's departure before we followed it back down, meeting the Valley Train in Bartlett, and then following it to Mountain Junction, where we bent the iron, and contined to Redstone. But there's more... we continued east to the Saco River bridge, which is decked over for snowmobile use. (June 25, 2017) Six cars and nine crew members patrolled for NEGS today. We inspected the new Sewells Falls crossing, and trimed the sight lines. Clif showed us the progress that has been made on the historic signal cabinet. (June 24, 2017) Another great day through the Notch was had by the CVRTC members that volunteered during last year's Day out with Thomas™ events. If you don't like the weather in New England... wait a couple of minutes. The weather Gods change their minds; we only had a very short light mist during seton and some rain through the Notch which was over by the time we arrived at Fayban. Other than that we had warm temperatures, sunny skies with a nice cool breeze the rest of the day. We had a safe, accident-free trip with nine cars and 18 riders. The day started off with a safety talk at eight. After our arrival at the North Conway depot, Paul Hallett thanked us for the help the CVRTC does during the Thomas weekends, finishing up with a short safety talk. Off to Fabyan with stops in Bartlett and Crawfords. On our return trip, we met the North Train at Crawfords, where we waited for it's departure before we followed it back down, meeting the Valley Train in Bartlett, and then following it to Mountain Junction, where we bent the iron, and contined to Redstone. (June 5, 2017) Bruce reports that the bridge is finished. The recent weather has rained out on starting the Memorial Garden. Bruce and Dave will try for later this week. Bruce spoke with contractor regarding brush chipping; no problem with holding off for a couple of weeks until the base of the trail is established. 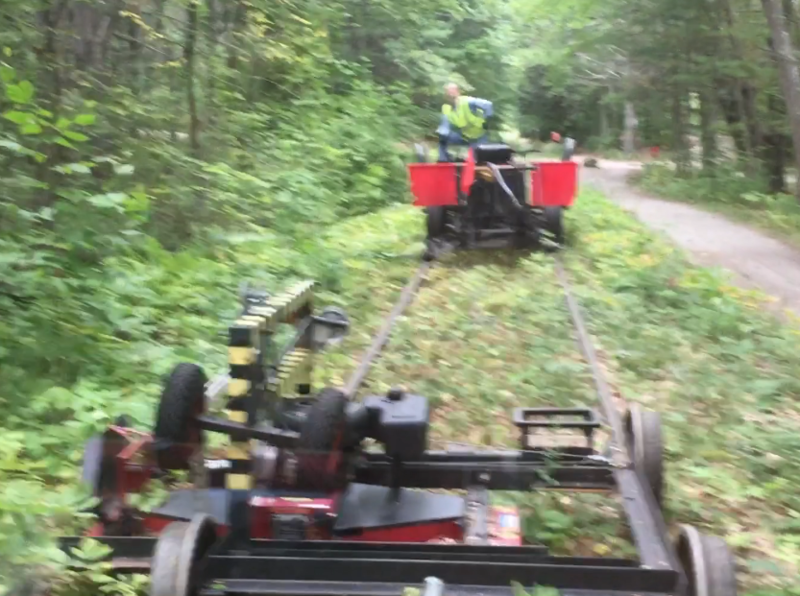 It will be a lot easier to move the chipper and tractor up the line utilizing the trail opposed to negotiating the ties. We've had a chance to take a look at what we're dealing with regarding brush. Not as much, or big as first thought. Mike said that because of the amount of fill they're digging out of the embankments, they are going to fill the holes with as much brush as they can, and cover it. Will be a huge help for us. (January 2, 2017) Happy New year! We hope you are doing well. The 2017 Cotton Valley Membership Application has been put on the Membership page. Send your application and dues as soon as possible but no later than February 18. Don't forget to indicate whether your application is for a single individual or for a family. Membership cards and rosters will be handed out at the annual meeting. Please make every effort to send your application/check BEFORE the annual meeting - by February 18 at the latest - in order to allow time to print membership cards, as well as print the roster.